Life has been a mixture of interesting, exciting and exhausting events for us in the past few days. Soon after the workshop, I got a call to shoot for a television episode to be aired this weekend, the details of which I would be sharing soon on my facebook page and twitter account. And on the day before the shoot I had to take a 4.am flight in the morning to be with the husband on an important occasion in his life and take a flight back the same day. With his hectic schedules, It had been days since Ro and I sat together for a comforting home cooked meal. So when he decided to make it for dinner at home yesterday, I made this simple yet exotic and very comforting coconut rice with an amazing protein and nutrient packed brown chickpea salad alongside rotis, palak dal and a simply spiced eggplant dish. 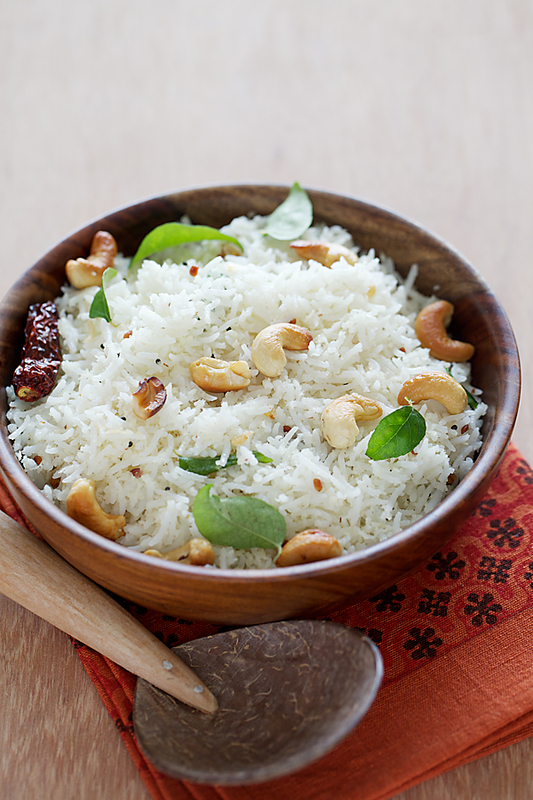 I use coconut profusely in my cooking and I simply loved using it here in this flavourful coconut rice with all the delicate aromas of this tropical nut. Any of these curries or a simple vegetable stew would be great with this rice too. 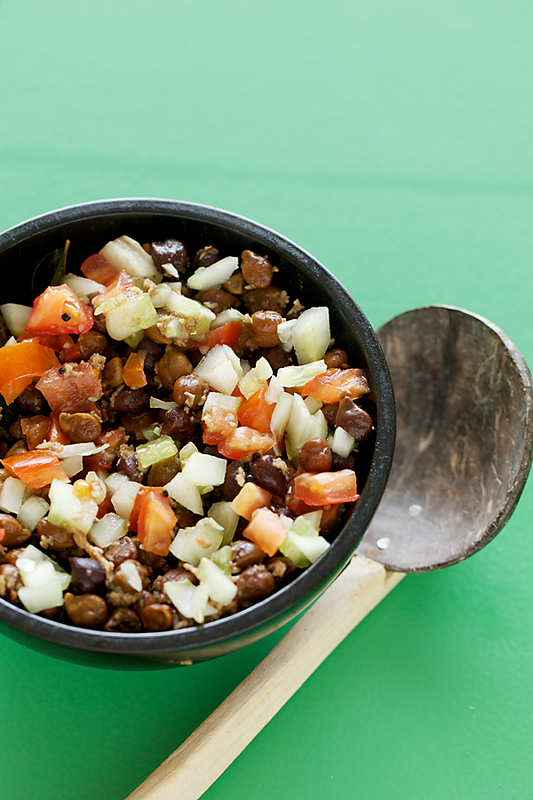 But throw in the brown chickpea salad with this rice and you have real hearty fare! They not only pair well together but the salad with all its wholesome goodness makes this a complete meal. If you are new to cooking with brown chickpeas, you will be pleasantly surprised with its nutty and mealy texture and its earthy taste. It is also a good source of protein for vegetarians and using it as a stuffing for chapati or paratha rolls makes it great for growing children too. Maybe it is because of the coconut or maybe it is some other ingredient or simply the magic of all these coming together there are certain foods that go beyond feeding your body and happen to touch your soul and to me this meal is one of them. I have used cashews here but you could use other nuts like peanuts or almonds too. Wash and cook the rice in a rice cooker or any other method of your choice with the specified amount of water. Allow to cool completely. In a wok, heat the oil over medium low heat and add the urad dal and mustard seeds. When the mustard seeds pop and the dal turns golden brown, lower the heat and add the chilies, curry leaves, asafetida, salt and coconut. 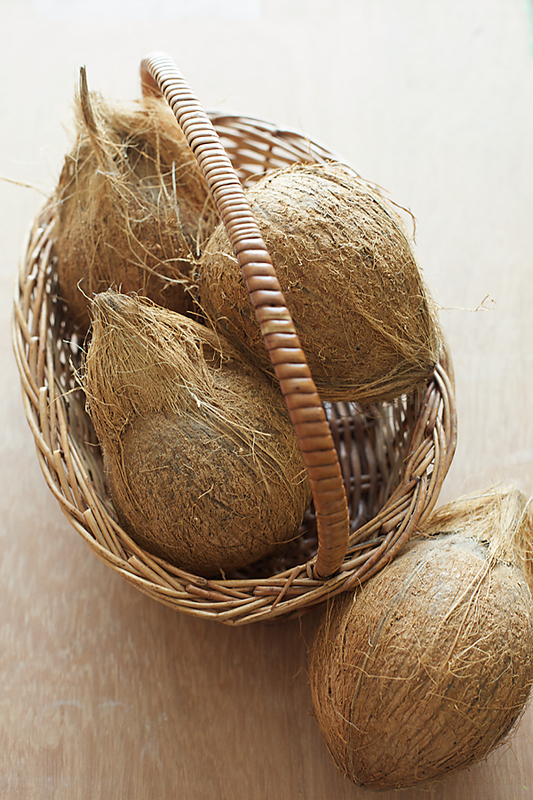 Cook the coconut on low heat for 3 to 4 minutes. Stir in the cooked rice and mix well. Take off the heat. Heat the ghee in a seasoning pot or a small wok, add in the cashews and stir fry until golden brown. Gently mix into the prepared rice. You can serve this salad without the raw vegetables or with them. Soak the brown chickpeas, overnight or for 6 to 8 hours in plenty of water. Drain and pressure cook the chickpeas with the water. Strain the chickpeas and reserve the cooking water. In a wok or a saucepan, heat the oil and put in the mustard seeds. When they pop lower the heat and add the mustard seeds, green chili, curry leaves, asafetida and the drained chickpeas. Put in the reserved cooking water and the salt and cook on medium low heat until the water is completely absorbed. Stir in the coconut and lime juice, mix well and serve as it is or garnished with the tomatoes and cucumbers. I am prathiba from "The indian food court". 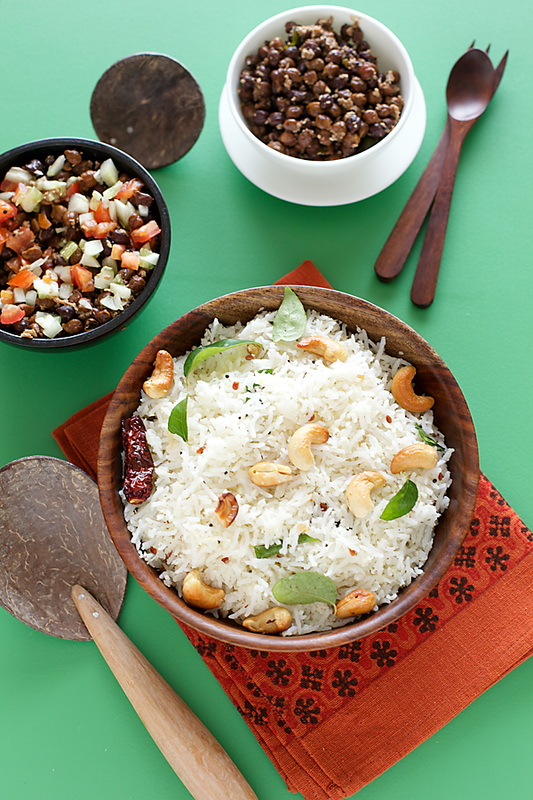 Your coconut rice really looks very yummmmyyyyyyyyy and feel like having it right now. Please check my blog too at your leisure and i have also put up the same recipe a couple of years back. Keep blogging and keep in touch. I gotta try this! Sounds delicious. Oh, a question, the 2 tsp urad dal (black gram dal), you say "add the urad dal and mustard seeds. When the mustard seeds pop and the dal turns golden brown" – do you fry that raw, or do you boil it first to soften it? Prixie: Yes it is delicious! You have to fry them raw, there is no need to pre soak. Hey I have been silent reader of your blog. commenting here for 1st time. That you have managed wonderful site and i am your fan of eggless baking recipes. you are right when husband or any loved ones praise for our food. its like worth of our all efforts and feel like heaven. This is nice combination of coconut rice with kala chana. looks delicious. Congrats on your tv show. btw may I ask which show is this? Kanan: Thanks..the show is called "The Foodie" on Times Now channel which is on air this weekend. Today it will be aired at 1.30 pm and 11.30 pm. Will post the link soon! Tried this today and came out absolutely 'divine'..true to its name! Just love whatever you post! I am one of the most loyal and ardent fan of your blog. I never miss your posts. Being a vegetarian that too Jain (no onion, garlic for me!) 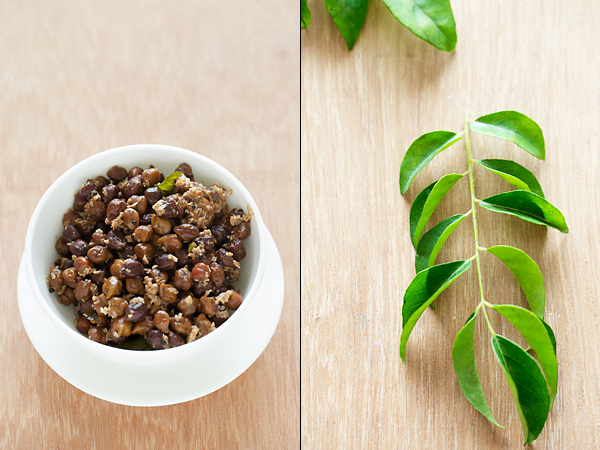 it's like 'akshaypatra' for me from where i can keep getting more and more exciting recipes. Thanks a lot! Going through net I just stumbled upon macaroons and they looked so lovely. but i couldn't find a single eggless recipe for them. can you help me with this since you are most innovative person to do it successfully and 'mouthwateringly'! 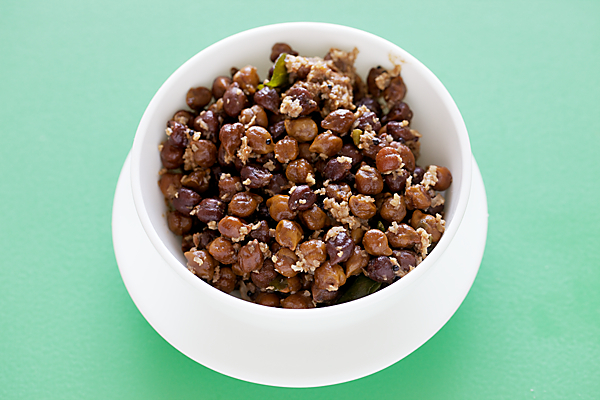 Love coconut rice…like the idea of pairing it with chickpea salad…will make a filling and yummy meal! I saw your show on Foodie. It was nice to hear the voice behind this wonderful culinary treasure. Your little one is sooo cute. Hope to see you on your own show one day. Archana: If you are measuring by weight, then it is better to do so with a weighing scale. You get measuring jars like pyrex with volume, cup and ounce measurements in stores like home stop in Indoa. Mamta: That's so nice to hear! Mansi: Thank you for your kind words. Will keep macarons in mind for sure. Sanjeeta: It sure is a filling and yummy meal. Manmita: You are too kind. Thanks for your wishes. I made both the rice and the salad today for lunch, as a special treat for my sister who was visiting. The simple, homely yet exotic food made our time together all the more special! Thank you so much for this recipe! Vatsala: I love to hear little stories like this. Food cooked from scratch with love makes all the difference and adds so much more to life. Thanks for sharing this incident from your life. I've been a lurker for a while now and tried several of your recipes. I just finished making and eating your coconut rice with brown chickpea salad. It truly is divine. I'm so glad I came across your blog.